The Equine Rescue Resource has been made possible by a very dedicated team. But in order for our resources to grow, the ERR Team must grow! The more resources offered, the better others in and around the equine industry will be equipped to help the horses. Join the ERR Team! Together, WE can make a difference! "Do you think they'll help out?" " I don't know, what do you think?" Red Diamond and Ziggy in fall of 2002. Beautiful PMU foals we rescued in 2001. The ERR has launched a Placement Program! We have opened our hearts and doors to horses that are in need of new, loving and competent homes. Horses that have been victims of abuse, neglect and starvation, horses that are unwanted and in danger of slaughter are welcome here. Our resources are very limited, but there are horses out there waiting to be helped. The horses that have to wait for help, or that are in our currently in our care, sure could use Guardian Angels. The ERR Placement Program will only handle a few horses at a time and with good reason... we want to make sure we can properly provide for ALL of the needs for ALL of the equines currently in our care. If you can find it in your heart to help with a feed/hay bill, a farrier bill, a vet bill or any other form of a sponsorship we would love to hear from you. Please know that your donations and contributions are tax deductible. The full sponsorship of a horse waiting to be adopted will free up resources so that we can help another. The more Guardian Angels we have, the more horses we can reach out to. Will you be a Guardian Angel? LOOKING FOR LOVE? SO ARE OUR HORSES! special equines. Besides, their love when given is unconditional and there is nothing sweeter than a gentle nicker greeting you in the morning or more heart warming than a horse kiss! Periodically, the ERR attends horse auctions and works with other established organizations to rescue slaughterbound horses. At times, we have even been able to successfully intervene and prevent horses from going to slaughter auctions. A few rescues have been facilitated already in 2001, and with your help we can rescue more! Your funds will pay, or help pay, the purchase price. The horse will then be entered into the ERR Placement Program or turned over to an approved rescue facility. Please know that your donations and contributions are tax deductible. Funds specificed for a horse rescue will NOT be used by the ERR for our corporate needs, 100% of your money will go to purchasing/vetting a horse in need. is related to responsible equine care and maintenance. And we love second hand stuff so please don't be bashful! Your donations and contributions are tax deductible. ERR holds Ebay Fundraiser Auctions. Send in your extra tack, collectibles or unwanted items, or hold an auction for us! Please tear off the seals on your bags of Agway and Blue Seal horse feeds and send them to us! We are also collecting proof of purchases for Farnam products! other services to keep the ERR up and running. $180 per year, or $15 per month. Help us help the horses! We would love to see educational materials reaching the equestrians who may not be aware of all of the issues! We can email you flyers for your printing and distribution. Not signed up for PayPal yet? And $5.00 will be donated to us at no cost to you! Shop Till You Drop AND Help Horses! Do you need a few things from the mall? Are you tired of parking lots, lines at the register and carrying packages? Why not avoid those hassles, shop on line through iGive AND help horses at Equine Rescue Resource Inc.
Equine Rescue Resource is a New York State Not-For-Profit Corporation working hard to make a difference for horses at risk or that have been victims of cruelty, abuse or neglect. When you become a member of iGive.com and register Equine Rescue Resource as your charity of choice, a percentage of everything you buy through the iGive.com mall goes to help the horses. Every penny generated helps to make a difference! Now you can get dressed, fill your fridge, feed your pet, restock your lawn and garden shed, order flowers and gifts, and buy that new computer, all online! Imagine how much money could go to Equine Rescue Resource Inc. if supporters did all of their shopping online at http://www.iGive.com/ERR, where up to 25% of every purchase is donated to Equine Rescue Resource Inc.! At iGive.com, membership is free! So hurry up and visit the Mall at http://www.iGive.com/ERR, where you can shop at the over 240 merchants, including favorites like Barnes and Noble, CDNow, JCrew, Amazon.com, PETsMART.com, JCPenney, Spiegel.com, Dell.com, CatToys.com, PetFoodDirect.com, AllPets, Dell.com, IBM.com, Outpost.com, Handspring, Tiger Direct and SharperImage.com for all your everyday needs. If you refer your friends and family to iGive, and they sign up, choose us as their charity and then shop, iGive.com will give $1 to the Equine Rescue Resource Inc. for each of your successful referrals! So go tell a friend NOW! Purchases made through this Jeffers Link will help the ERR! We will receive a small percentage of all paid orders, so please, if you order your equine supplies on line, order them through the ERR Jeffers Link found here! 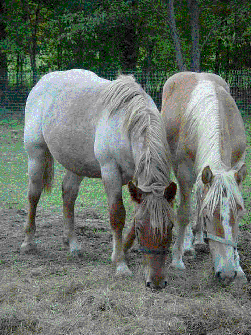 Free classifieds can be used to help get horses homes and supplies to those in need. List your available horses, tack, feed, hay, trucks, trailers, farms, foster space and fundraising items here. Email to schedule a visit! A program to rehabilitate rescue horses and place them at no cost or low cost with therapy programs.